Today I was thinking I would write a lovely little blog post about the Pakistan Independence Day celebrations that I attended this weekend. Or maybe I would write a little rant about the eyesore that is the boarded-up Willow Square on Hospital Street. I hadn't quite decided, actually, but those blog posts will now have to wait another day or so, because they have been pre-empted by another topic. They have been pre-empted by tragedy. They have been pre-empted by another accident on Highway 63. Yesterday morning I was checking in on Twitter for updates on the horrible fire that burned through an apartment building on Saturday night. I was relieved to find that there was no indication of any injuries or fatalities in that fire, and I was thanking our lucky stars that once again we seemed to have escaped a major fire without a serious injury or death. But then the tweets took an ominous turn. Photos from Highway 63. 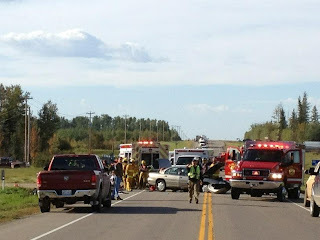 A crash scene. Helicopter on site to airlift a victim to the hospital. And then, the word I didn't want to hear. Fatality. I knew the day was coming. I have been dreading it since April 27, since the last horrific crash that took seven lives. I would say I have been waiting for it, except that to say I was waiting makes it sound like I wanted it to happen when I clearly didn't. I knew, however, that it was going to happen again. It was inevitable. And it happened yesterday, in a twist I called cruel irony. You see yesterday I was invited to speak at the Summer Safety Jam, an event hosted by The Coalition for a Safer 63 and 881. It's an event designed to raise awareness of highway safety, a family event meant to be fun and light. It's meant to remind us all of the responsibility we have to drive safely, the responsibility to ourselves, our family, and our community. I had written a speech, a pretty good one too, and when I was on my computer watching the tweets come in I was rehearsing my speech. I took a look at the tweets, looked at the speech in my hand, and ripped it up. I knew I would deliver a different speech instead. It appears that the accident yesterday would not have been prevented by twinning, and it is being deemed as due to driver error. And I think that is a discussion we need to continue having in this community, a discussion about our driving behaviour and that of others. I think we need to address our own driving (how many of us have done something while driving that in retrospect we know was dangerous or could have ended badly? ), and we need to look at the driving of those around us. While I think it is appropriate to point a finger at government and ask when twinning will be completed I also think we need to think about those three fingers pointing back at us, and look at our own responsibility. I think that we also need to continue to make clear to the Alberta government that we expect this highway to be twinned. One of my greatest disappointments continues to be the lack of a detailed and accountable timeline, one with dates for completion. And frankly, people, I'm not going to be satisfied until I have a document in my hand that includes those dates. I'm not going to shut up, I'm not going to go away, and I will continue to think, talk, and write about this issue until it happens. That's my commitment to myself, to you, and to the victims and families of those lost on Highway 63. I have had the great honour of getting to know people like Annie Lelievre, who lost her beloved son, and I have seen her pain first hand. I have spoken to others who have lost their family, and I have heard their pain. This is not a pain I want anyone else to endure. And so the battle continues. I have done several media interviews in the past 24 hours. In many I have said that we need to talk about driving behaviour, and we need to have a dialogue about our own responsibility in keeping our highway safe. However, that does not let the Alberta government off the hook. They too have a responsibility, and that is to meet the commitment they have made to get this highway twinned. I don't think it's unreasonable to expect to see a timeline, as the recommendations made by Mike Allen were delivered some time ago and I think there has been adequate time to study them. I think it is quite reasonable to expect an accountable timeline, and to see it delivered soon. And in my mind I believe that timeline should indicate a completion date of 5 years. You see we are expecting exponential growth in this region. By 2030 we may see our city expand to a population of 230,000 people, more than double our current population. And we need to have a highway in place that can handle that population, and one that keeps those residents safe. And in my mind a twinned highway will help to achieve that goal. I have said many times that twinning the highway is only part of the solution, and I continue to believe that. While it is only part of the solution, though, it is a key component. What I would very much like to see is our community having those discussions about driver behaviour and driver safety - and having those discussions while graders and pavers are completing the twinning process. We all have a role in this, the community and law enforcement and you and I and the government. We all need to work together to address every facet of this issue. We all need to ensure that our common goal - to end the deaths on Highway 63 - is accomplished. We can do it together, and we can do it in a way that is community-building and preserves the fabric of our community. Every death on Highway 63 affects the families of those lost - but it also reaches deep into the heart of our community, ripping at the fabric that binds us together. The ripples from each death go far beyond the families, although they bear the greatest brunt of the grief and pain. Yesterday was indeed cruelly ironic. It was, in fact, just cruel, a day when more lives were lost and other lives changed forever. That is why we need to do everything we can, from twinning to increased patrols to penalties to addressing driving behaviour, to stop it. The cruelty must end. 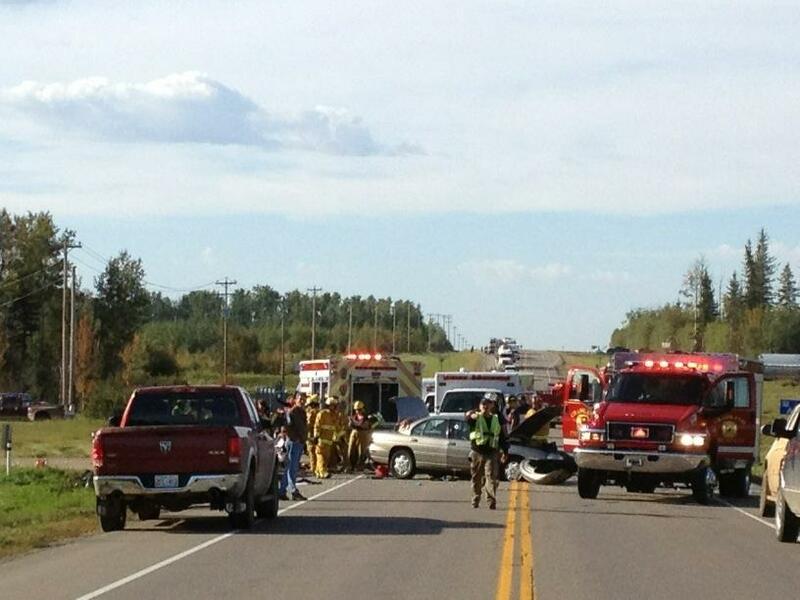 The carnage on Highway 63 must stop. We have the power to make it happen. So let's do it. speedy recovery of those injured. who serve our community so well. a responsibility to keep our highways safe. please provide a detailed and accountable timeline. I think we have waited long enough. I had a very interesting conversation at work over the weekend about the lack of progress on 63 and had planned to blog about it until it was pre-empted by the Thickwood fire. It simply blows my mind that a region that contributes so much to the Canadian economy is stuck with such a pathetic land link to the rest of the province and nation.